After three years of litigation challenging the Oceano Dunes “dust rule,” the 2nd Appellate Court in Ventura ruled Monday that the San Luis Obispo County Air Pollution Control District (APCD) does not have the power to regulate air emissions at state parks through the permit process. The dust rule requires the California Department of Parks and Recreation to reduce the particulate matter blowing from the Oceano Dunes State Vehicular Recreation Area or face fines of $1,000 per day. The rule is based on a study that concludes off-road vehicle activity on the dunes has caused an increase in particulate matter blowing to the Nipomo Mesa. In 2012, Friends of Oceano Dunes filed a suit against the APCD saying it used flawed scientific practices in its report and that it failed to prove that off-road vehicle activity has caused an increase in pollution on the Nipomo Mesa. The appellate court turned Crandall’s ruling on the meaning of the word contrivance. In addition, the appellate court awarded Friends of the Oceano Dunes costs. Don’t miss links to local news stories, like CCN on Facebook. We would have better air quality in Paso if the APCD was disbanded. They are the ones giving controlled burn permits to State Parks and farmers who want to get rid of weeds. If anyone in Paso suffered with respiratory ailments during February and March of this year, it was likely because of smoke in the air from controlled burns authorized by APCD. We don’t need burns to get rid of nonnative plants and purple thistle when we have plenty of wild fires that will occur. Meanwhile, kids are out on the playgrounds, sports teams are practicing, etc. with ACPD approved smoke particulates in the air ( particulates as bad as sand). Having lived in Arroyo Grande and having watched the Eucalyptus trees that served as tall wind breaks (planted for a reason by our pioneers) being destroyed, I am not surprised that blowing sand is a problem now. Replant the tree barriers if you want the sand contained. 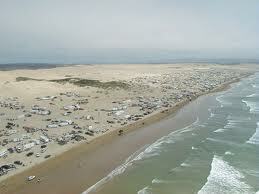 Otherwise, the sand will blow from the beach into neighborhoods, with or without ATVs. How is it that burns from wildfires harm lungs less than permitted burns? And, can you describe the geobiological manner in which euc trees FILTER SAND from the air ? They may IMPEDE the air but I don’t think they FILTER it ?